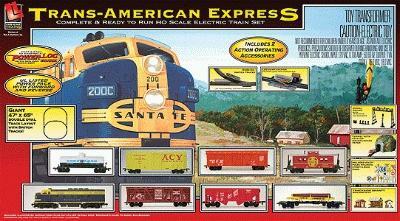 This is a Trans America Express Sante Fe Model Train Set HO Scale from Life-Like Trains. Retail $197.99 SAVE 24% ! There's plenty of action and adventure down the tracks! This big diesel freight set is loaded with fun that starts with a powered F7 diesel with working headlight that's finished in classic Santa Fe colors, Six colorful freight cars are included, along with a Santa Fe caboose. To add to the fin, the set includes two working switch tracks, a kid-powered log dump for use with the log car, three trackside shanty kits and a tunnel. You'll also get 19 railroad signs and 12 utility poles, plus a trackside signal bridge. For fast and easy set up, you'll get a complete 47 x 65" 1.1 x 1.6m double track oval featuring Power-Loc track. A UL-listed power pack, plug in terminal wires and complete set-up instructions are all included in this complete set.